Editor's note: As 11/11 rolls around each year, we’re reminded of the veterans who selflessly serve our nation with great honor. We’re especially inspired by the veterans who return to civilian life to build successful small businesses — the engine of our economy. To celebrate those who serve our country in more ways than one, we talked to a few vet-run companies to learn the stories behind their vision, the influence of the military on their business philosophy, and their advice for aspiring veteran entrepreneurs. Here, we hear from Mark Rockefeller, former Air Force officer and co-founder and CEO of StreetShares, a socially-oriented online lending platform where investors compete to give loans to high-growth vet-owned and main street business. Veterans today return from service to a country that bears little resemblance to the ticker tape parades and land of opportunity that characterized the end of World War II. With ready access to capital and local banks willing to lend money to former service people, nearly half of the vets from my grandparents’ generation went on to own or run a business, driving one of the most remarkable economic growth periods in recent US history. Now, with fewer regional banks and more red tape, large global banks base their lending decisions on little more than a FICO score. This makes it nearly impossible for vets, who have incredible skills but limited financial history, to pursue their entrepreneurial aspirations. I had a front seat to our country’s most recent financial unraveling, which only worsened this situation. After nine years in the Air Force —including a stint as a Jag lawyer in Iraq — I joined a law firm that represented some of the creditors trying to get their money back from Lehman Brothers. I learned how bad mortgages started, moved hands, took on more risk, and ultimately wreaked havoc on our economy. I saw how businesses across the country lost their savings and were forced to shutter their doors, while new businesses couldn’t gather the capital to get off the ground. I started StreetShares to breathe life back into the American dream for a new generation of veteran entrepreneurs and aspiring business owners. As a vet who saw firsthand how hostile the economic climate can be for a young company, I want to help people access the capital they need to start their businesses. With StreetShares, businesses tell their stories and create pitches on our online platform, and investors compete to fund parts of that loan at rates they set themselves. That way, investors learn about the people behind the ideas and their loans are both financial and personal. 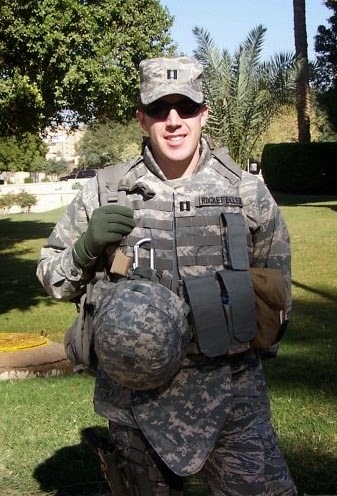 When I was stationed in Iraq with the Air Force, I worked on a project with a 24-year-old platoon leader whose responsibilities resembled those of a mayor — he ran an entire town’s public projects, security and education systems, and even started a community microloan program. While most people his age were dipping their toes in their first jobs out of school, he was running a small city. It’s guys like him that make me wonder, if they handle this kind of responsibility and lead in that kind of environment, imagine what they can do back in the US. And I want every one of them to have a shot at showing what they’re capable of, to pursue that dream. There’s a battle for how this generation of vets is characterized, and my mission is to prove they’re our country’s future leaders. The US economy is looking for a catalyst, and I believe vets can be exactly that — they can fight the financial battle here at home just as they fight the military battle abroad.